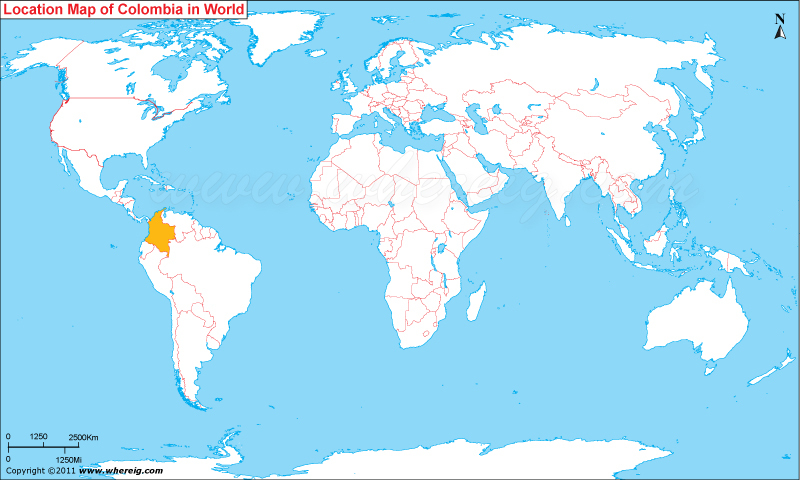 About Map: Map showing location of Colombia in the World. The Colombia location map shows that Colombia is located in the northwestern part of South America continent. Colombia shares its international boundaries with Venezuela and Brazil in the east, Ecuador and Peru in the south, and Panama in the northwest. Besides, country has coastline with Caribbean Sea in the northeast and with Pacific Ocean in the northwest. Surprisingly, Colombia is the third largest populated region in terms of any Spanish-speaking country in the world, after Mexico and Spain. Colombia has quite old constitutional government. The two oldest political parties of Colombia are the Liberal party and Conservative party, which were founded in 1848 and 1849 respectively. In spite of having such long years of government, country is not free of violence. There is evidence of longest-running armed conflict, largely takes place due to cocaine trade. Guerrillas war in Colombia is quite known to all over the world. However, in recent time the violence is decreased down. Country's greater parts of the urban centers are located in the highlands of the Andes Mountains. Besides, Colombian territory has also Amazon rainforest and tropical grassland. Moreover, due to strong security not only internal violence decreased but also it has facilitated Colombia tourism. These days, Colombia is also earning substantial income from tourism. There are many natural landscapes and cities of tourists interests. The capital city Bogota is one of them.